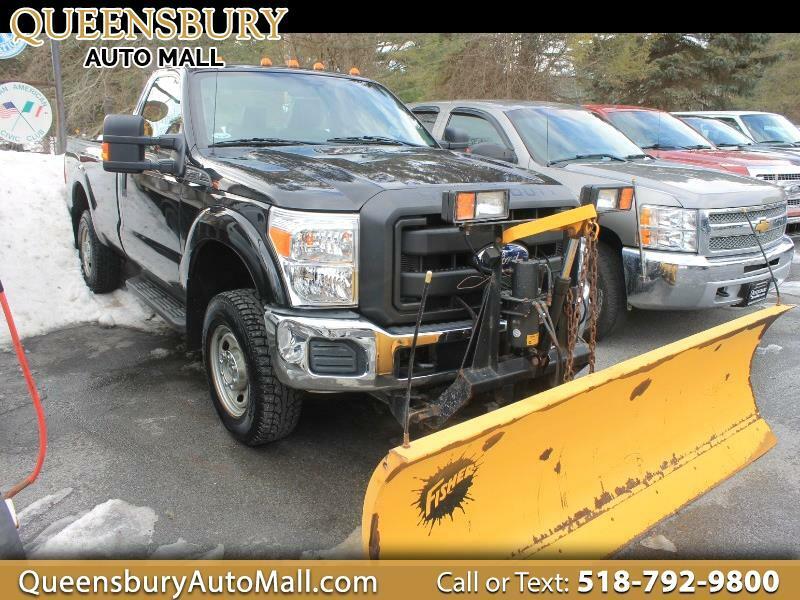 ***HERES A SLEEK 2011 FORD F-250 4WD REGULAR CAB PLOW TRUCK XL IN AMAZING SHAPE AND COMPLETELY BABIED - COME ON IN FOLKS TO QUEENSBURY AUTO MALL LOCATED AT 635 GLEN STREET IN QUEENSBURY, NY 12804 FOR A DEAL ON YOUR NEXT PLOW TRUCK - TRADE IN THAT OLD RIDE TODAY AND LETS GET YOU A TRUCK THAT CAN HELP MAKE YOU SOME MONEY*** 6.2L V8 OHV 16V MOTOR! CLEAN CARFAX HISTORY REPORT! ONE PREVIOUS OWNER! FOUR WHEEL DRIVE WITH LOCKING TRANSFER CASE! FISHER MINUTE MOUNT 2 PLOW PACKAGE WITH HAND HELD CONTROLS! TOW PACKAGE WITH TRAILER HITCH RECEIVER, ELECTRONIC TRAILER BRAKING AND OVER DRIVE HAUL MODE! ELECTRONIC TRACTION CONTROL SYSTEM! AM/FM/CD PLAYER WITH AUXILIARY INPUT JACK, USB IPOD INTEGRATION AND SATELLITE RADIO! FULL CABIN HEATING AND AIR CONDITIONING! REAR WINDOW DEFROSTER! 3 PASSENGER SEATING CAPACITY! SIDE AIRBAG CURTAINS! SLIDING/RECLINING SEATS! KEYLESS REMOTE ENTRY SYSTEM! TILT/TELESCOPE STEERING WHEEL WITH CRUISE CONTROLS! FRONT TOW HOOKS! STEEL WHEELS ON FRESH TIRES!